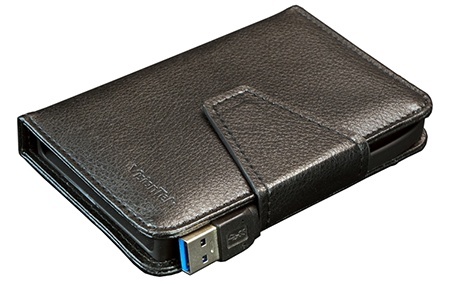 Portable USB 3.0 2.5” Drive Leather Enclosure with Built-In USB Cable For PCs and Macs. The VisionTek Wallet Drive is a 4.72” D x 3.14” W x .78” H leather wallet enclosure with an integral 7” USB 3.0 cable. It is designed to accept any 2.5” SATA hard disk or SSD and turn it into a pocket drive. The internal fixing has a screwless snap-in design so you can easily insert (or remove) a drive without tools. There is a small blue LED that shows solid for power and flickers during drive activity just like almost any other drive. The whole enclosure is bus powered and so needs no extra cables or power supply. Being USB 3.0 it is pretty fast and backwards compatible with USB 2 at a slower transfer rate. The only caveat is that VisionTek say certain drives may require USB 3.0. 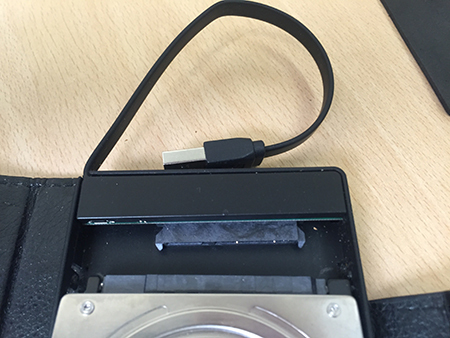 The wallet comes with a cut to size high density foam pad that protects the inside of the wallet from scuffing from the drive surface and serves as packing if you insert an ultra thin 7mm height drive. 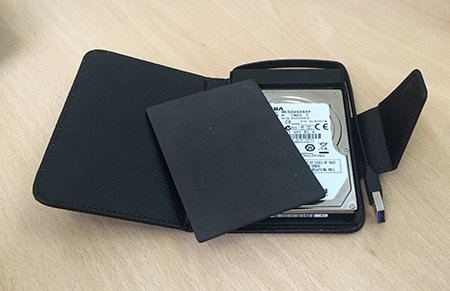 Even with a 9.5mm mechanical hard disk inserted the complete package weighs only 4 ounces. Open wallet showing drive, cable, packing and clasp. The wallet is manufactured in what feels to be a good quality black leather with a fold over magnetic closure that also holds the flat USB cable in place. The magnetic clasp has a good solid connection and is not prone to coming undone. The flat 7” USB cable is integral and is of a good sturdy weight and feels like it will stand up to a few years of use. My one concern is that, being integral, if the cable was to suffer damage then the whole enclosure would be compromised. The snap in screwless tray is very simple to use and holds the inserted drive firmly and it feels secure and stable. Removing the drive can take a little more care but is still simple and easy. There is not a vast amount more to say about The VisionTek Wallet Drive. It is never going to look as slick as a dedicated pocket drive, but if you have old useable 2.5” drives around it is a good solution. It is also a handy “diagnostic” tool if you have a need to test removed 2.5” drives on site. This is a well made item designed to fulfill a particular niche and it does it very well. I give the VisionTek Wallet Drive a MyMac.com review rating of 7 out of 10.